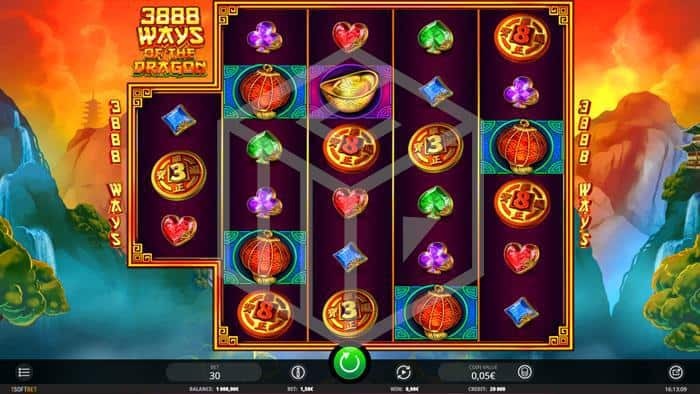 iSoftBet’s latest foray into the popular Asian themed slot, 3888 Ways of the Dragon was released on 12th December 2018 and is a highly volatile affair with an unusual 3,888 ways to pay and stars a magic Chinese dragon who flies overhead to rain down wilds and wealth on its players. The non-standard reel set-up sees a 5 reel slot with only 3 symbols on the first reel but 6 symbols on reels 2-6 which gives you 3x6x6x6x6 = 3,888 ways to pay as all adjacent matching symbols create win paths. Spins cost from €0.30 to €30 a time and the slot has a maximum possible single spin win of 12,690x the stake. The design is ok, it's passable. There’s not much more to say really. It’s what we’ve come to expect from slots with a generic Asian theme. There is the mountainous scene in the background, picturesque animated waterfalls, bonsai-looking trees, silhouetted temples, and mystical and misty orange skies above. The gold-framed game board contains many of the usual oriental symbols and a generic plinky-plonky Chinese instrumental accompanies play. So far, so ok. The low-value symbols are represented by the four card suits; diamonds, clubs, hearts, and spades. Medium value symbols are two coins, one with the number 8 and one with the number 3 (both are lucky Chinese numbers). The high-value symbols are a Chinese lantern, a golden dish, a golden turtle, and a frog ornament. The frog is the highest value symbol, paying 100 coins for 5 in a row (which works out to 3.33x bet size). The wild is a golden Chinese dragon mask and the scatter is a multi-coloured circle of dragons. The Dragon Spin feature is available in both the base game and during the bonus round and the bonus round is a free spin feature. 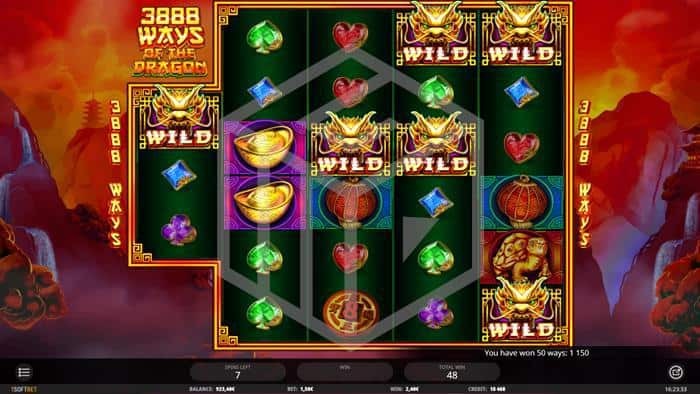 At any time during either the base game or the free spins round if the reels take a little longer to land and before turning darker then a Dragon Spin is on its way. After the reels become gloomy a flying golden Chinese golden dragon flies back and forth across the game board, depositing between 3 and 8 wild symbols on the reels below along the way. If you land 3 scatter symbols then you will be awarded 8 free spins, but if you manage to land 4 scatters then you’ll receive 18 free spins. 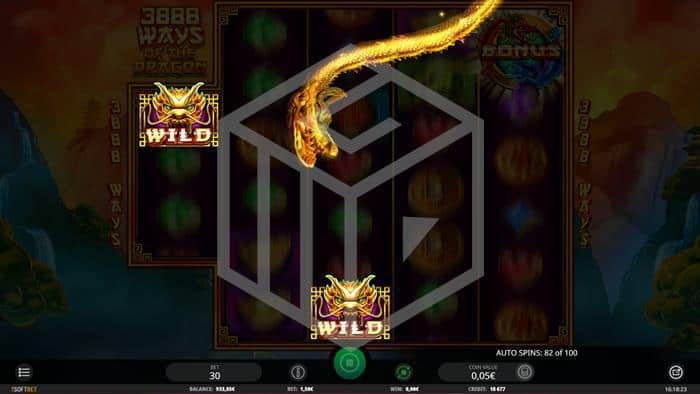 During the free spin round the frequency of Dragon spins increases significantly so you can expect 2-3 appearances from the wild dropping monster. The jury is still out on 3888 Ways of the Dragon at our end, to be honest. I definitely like the name; a good old play on words combining the number of ways to win with one of the most iconic Chinese made films of all time, Bruce Lee’s, ‘The Way of the Dragon’ (set in Italy by the way but now I’m quibbling). I’ve nothing against the design either really but it is perhaps a little too generic to be worthy of praise – I much preferred the simple but effective artwork from another recent iSoftBet Asian slot, Mystery of LongWei. As to the game itself, it’s definitely not the most exciting with very low base game wins, and even the appearance of the Dragon Spin here will often leave you empty-handed. However, as is very often the case with high volatility slots, it’s all about the free spins round. Here you’ll find the wins far more substantial and usually a far more generous and prevalent magic dragon. This will be enough for many a high variance fan, but personally, I didn’t find the feature that exciting; random wilds are nothing new and despite some decent wins I didn’t find myself engaging with 3888 Ways of the Dragon as much as I’d have liked. Overall I’d say yes it’s worth a shot especially if you like “ways to win” and high variance slots – but don’t expect to be bowled over. This game is available on our list of streamers top rated online casinos that are both fully regulated and licensed by the UK Gambling Commission and / or the Malta Gaming Authority. Pick one and grab yourself a great promotion while you check out our best casino bonuses section. We're constantly testing and going trough new games on a daily basis. For more reviews, go to our online slots section.